so together we can create options and expansion plans to support your current and future demands. 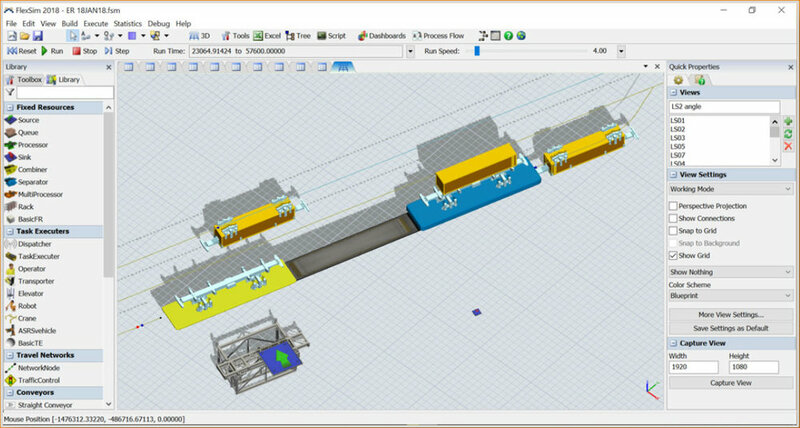 Together with ZPMC’s Smart Solutions Port Automation division, we import your custom designed automated overhead container transfer system CAD design files into FlexSim simulation software, and can create multiple layout options with variable capacity rates to stress-test all aspects of your system options. Focus on patented tripletrack, double load/unloadstation operations that interface with bombcart/port truck transfer. Eagle-i logistics software schedules and times all pick-ups and drop-offs through proper routing and load balancing, working with a variety TOS systems like Navis. Empty container and empty carrier placement are critical. Copyright © 2017 Eaglerail Container Logistics Inc. All rights reserved.